It’s time for Art! Abstract Canvas Art. It’s been awhile since I’ve done any art work. When I say art, I mean in the most abstract way possible. As an artist, (and I use that term extremely loosely) I am not so good at drawing – the connection between what I see in my head and what is drawn by my hand is shonky at best – so we lump painting, and any other artisic endeavor in the same box. When you think art what comes to mind. Landscapes, portraits, still life…. That’s not what I do. Abstract though, that’s more like it. The less… structured, the better. Full of life and crazy is more my style. If you can call it a style. 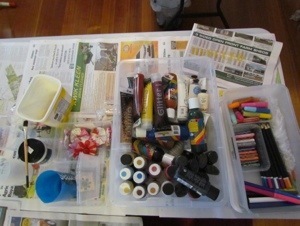 I have a fortnight before my next market and I am counting on taking more canvas and making a full on mixed media table. So over the next couple of weeks I will show you what I am working on and if there are any processes I’ll show them . 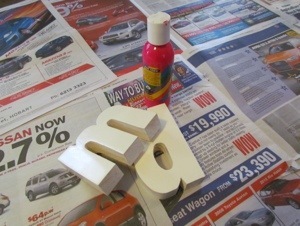 I also have my wooden letters (M & D) that have been lightly touched with white paint. I will be making them pink, hot pink of course, and jazzing them up. My table is all set out, newspaper, paints, pens and glitter. 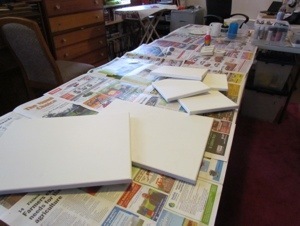 Sponges, paintbrushes and of course a half dozen of canvases. I figured if I set it out the night before then I can’t just decide to fill it with beads. This entry was posted in Canvas Art, Misc craft posts, Mixed Media, Uncategorized and tagged abstract, canvas, collage, drawing, ideas., letters, Paints, papers, pens. Bookmark the permalink.